Alesis present the Surge Mesh Kit, exceptional power, robustness and playability packaged in a compact size at an affordable price. 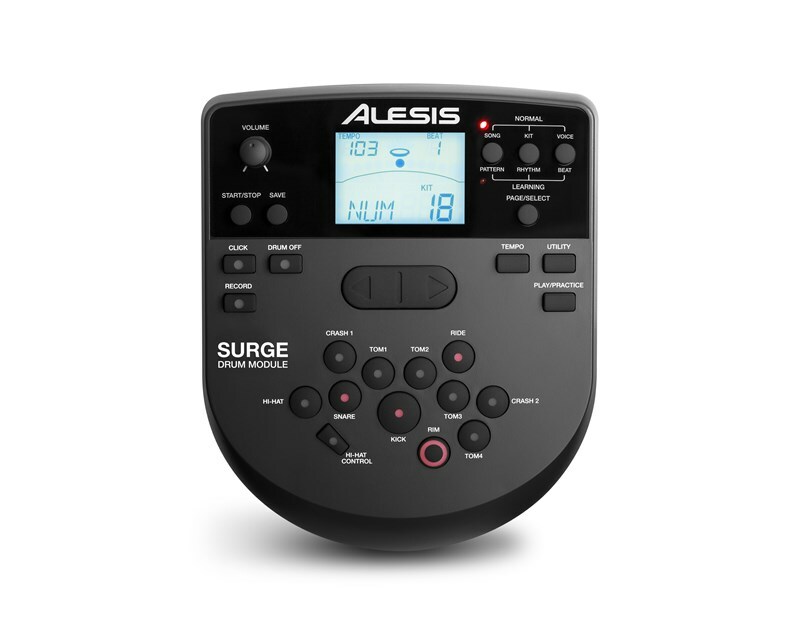 New to 2018, the Alesis Surge Mesh Kit is a formidable entry from Alesis into the electronic drum kit market. Complete with five drums and three cymbals, the Mesh Kit also features an 8-inch mesh kick pad tower, kick pedal and hi-hat pedal. Combine this with a package that even includes drumsticks and a tuning key, the Alesis Surge Mesh Kit arms you with everything you need to get playing immediately! Feel at home on the Surge Mesh kit thanks to its adjustable 10" Dual-Zone mesh snare pad and three 8" Dual-Zone mesh tom pads, all of which feel natural and highly responsive, allowing you to focus on mastering your technique. Take your kick playing to the next level thanks to the included 8" mesh kick tower pad, large enough to accommodate a double-pedal should you wish to equip one. The Surge Mesh kit also comes complete with three 10" cymbals including a ride, hi-hat and crash (with responsive choke mechanisms). All elements of the kit are housed on a robust 4-post chrome rack that sets up with ease and takes up very little space, furthermore, the low-weight of the unit makes it incredibly portable. 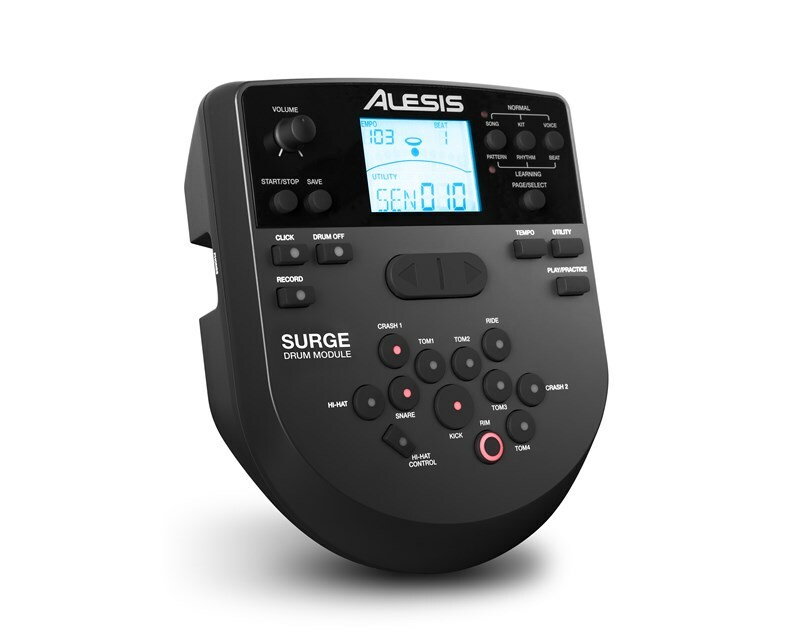 The Surge Drum Module equips the kit with a powerful brain that brings your playing to life. Play one of 40 drum kits (24 presets and 16 user kits) that feature 385 individual sounds that can be custom-assigned to any pad trigger or cymbal. Play one of many fine-tuned professional kits or create your own, custom setup to suit your playing style. browse through tight punchy snares and kicks apt for Hip Hop and Neo-Soul, to booming, gated drums suitable for rock and metal, no matter the genre and style, this module has you covered. Additionally, you can customise your kit further by utilizing the onboard effects that include reverb and 3-band equaliser. To aid in your practice, play along with one of 60 available tracks or utilise the stereo AUX in to play along to your own music. Ensure your timing never slips up thanks to the intuitive onboard metronome and expand your playing potential even further by making use of the advanced sequencer and performance recorder! Whether practising at home in silence thanks to the headphone jack or jamming it out on PA via the stereo outs, the Alesis Surge Mesh Kit is an advanced and highly adaptable electronic kit that's perfect for any playing scenario and any playing style. Power: 9 VDC, 500 mA, centre-positive Note: This appliance is not equipped with a main power switch. Even when the appliance is turned off, the power supply to the appliance is not completely turned off when the power adapter is plugged in. Disconnect the power adapter when not using the appliance for long periods.